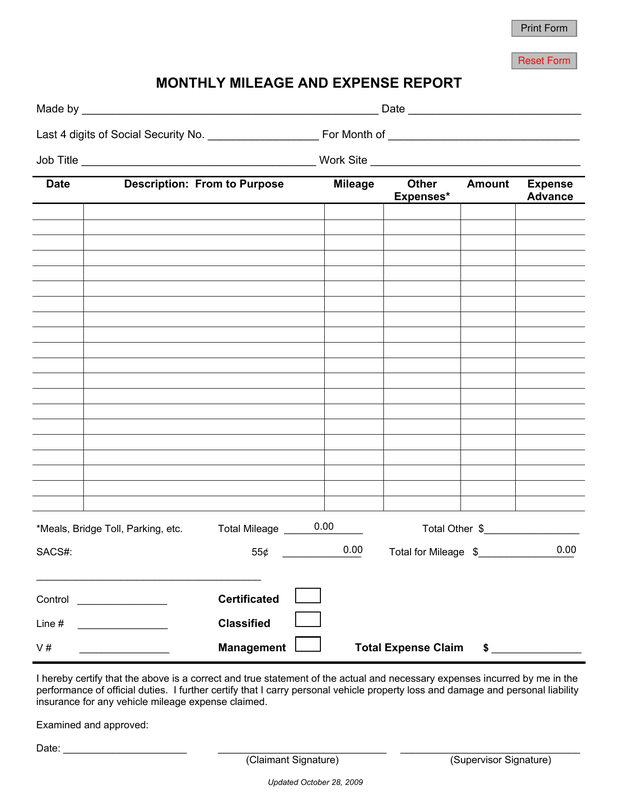 Download the Mileage Expense Report Form that is designed to track mileage expenses that are consumed for business purposes only. This particular form will also enable the tracking of other expenses as well. This will help keep a well kept log, to be turned in on a monthly basis to both prove expenses and the reason for them. As well if reimbursements are due this will make it possible for the accountant or HR manager to identify those reimbursable expenses and return them to you. Step 3 – Section 3 – Meals, Bridge Tolls, Parking, etc. Add the sum of the entire claim and enter it into “Total Expense Claim” line provided. Read the information at the bottom of the form, once the form has been completed for the month. If you agree you must date and provide your signature stating that you attest to the fact that all recorded information is correct. Turn the form over to the accountant or HR manager (whomever handles the financials, for their examination and approval.